Who doesn’t like a great deal on books, especially when the funds are going towards charity? 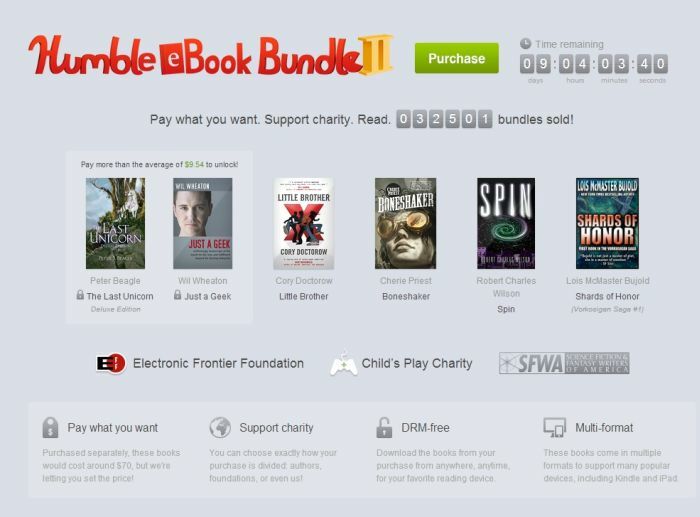 I first heard of the Humble Bundle through their video game sales, but quickly fell in love with the ebook bundle that they started putting out. The sale is simple. You can make a donation for any amount that you want, and you’ll get four books. If you donate above the minimum amount, you’ll get two extra books on top of it. It supports charity and you get to decide how much money goes where. The books are DRM-free and come in multiple formats, so you don’t have to worry if you’ve got a kindle or an ipad etc. A fantastic collection of fantasy, science fiction, steampunk, and a little humor. I’ll be honest, since I’m not exactly a huge fan of science fiction I probably wouldn’t have given these books a chance, but a good deal will always win me over – and who knows, my reading taste is constantly shifting (hence the nomadic part of this blog) and there’s nothing stopping me from becoming a huge fan of the genre. I don’t personally see it happening anytime soon, but there’s always that ONE book out there that just completely wins you over that you never expected. Being more of a fantasy reader of course I have read The Last Unicorn, and highly recommend it for those who haven’t read it yet. I’ve always been far more enthralled with reading books than watching movies, and that really holds true in this case. The sale is on for another 9 days so if you’ve been sitting on the ledge about it keep in mind the money goes towards a great cause and you really can’t go wrong getting so many books at that price.